Our next chat, on Tuesday 3 February at 6:30pm UK time, is about what we can do about the crisis in UK public libraries. The Agenda is available for you to add questions. We chose this topic partly in honour of National Libraries Day, Saturday 7 February 2015. 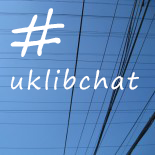 We also felt it was an overdue #uklibchat topic, considering the scale of the threat to public libraries. It is a topic close to my heart. I worked in public libraries 2008 – 2013, as a library assistant and as a children’s librarian. I left when my children’s librarian role was eliminated in a restructure and now work in a university careers service. This month, instead of an article giving one point of view on the crisis in UK public libraries, our feature article will be a digest of links and sources for finding out about where UK public libraries are currently, how they got there, and what we can do about it. You can use this article to help inform yourself before the chat, get thinking about the issues, and about what you might be able to do. The best source for information about what’s happening to public libraries in different areas across the UK is Public Libraries News. Run by Ian Anstice, this site is updated frequently and you can find out about changes by local authority. The Library Campaign also offers daily updates on public libraries news. The Public Library Service Under Attack, a report from the public sector union Unison which represents many public library staff, is from 2013 but provides a fairly concise overview of the cuts between 2010 and 2013, with lots of facts and figures. A Changing Landscape: A Survey of Public Library Authorities 2012-13 is a report from CILIP which charts cuts and their effects. The main answer to this is cuts to public spending. Local authorities in the UK have been particularly hard hit by cuts. Councils have very little control over their own budgets. In recent years central government have manipulated their grants to local authorities to prevent them from raising council tax, their only substantial means of raising income. This BBC article illustrates this issue. This article on the ‘Barnet Graph of Doom’ sheds some light on the pressures on local government budgets now and in the near future. The Arts Council England addressed the changing role of libraries in the UK in their 2013 report Envisioning the Library of the Future. The Pew Research Center has an interesting report on public libraries in the digital age. This research is from the US but is an interesting insight into how people use public libraries and how new technologies have and haven’t changed this. Voices for the Library has a page about the reasons for public libraries and why we need them today. Public Libraries News also has a page on reasons we need public libraries, with a good section on mythbusting. Public libraries news has many resources and ideas for campaigners. Voices for the Library has ideas about what you can do and other resources for campaigners. The very recent Sieghart Report is the All-Party Parliamentary Group for Libraries’ view on the way forward for UK public libraries. The Library Campaign reports on it here. The University of Toronto has developed a MOOC in library advocacy which is available through edX. The Carnegie Trust UK have recently published a set of resources for public library advocacy called Speaking Volumes. It includes a leaflet, poster and several databases of examples of how public libraries have an important impact. I hope you can join us for the chat on 3 February, where we’ll talk more about what we can do and share experiences of library advocacy. Former public library Children's Librarian, now working as a Careers Information Officer in a London university. Nearly finished being an #aberils student. This entry was posted on January 30, 2015 by spoontragedy in Feature and tagged future of libraries, libraries, library profession, library users, public libraries.